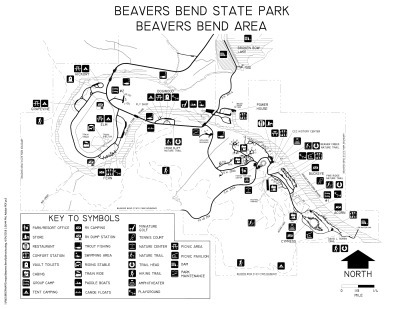 Beavers Bend State Park is located in the mountainous region of southeast Oklahoma along the shores of Broken Bow Lake and the Mountain Fork River. Guests traveling down the winding roads through the forests of pine and hardwood trees will find adventure, beautiful scenery and plenty of activities inside this state park. The scenic beauty of Beavers Bend State Park makes it one of Oklahoma’s most popular areas. Towering timbers, crystal clear waters and rugged terrain make this state park an outdoor lover’s paradise. Visitors to Beavers Bend State Park will enjoy hiking, biking, boating, fishing, water skiing, nature center activities, river float trips, canoeing, horseback riding and much more. Trout streams are stocked year-round and the park features two catch-and-release trophy areas. Escape into the serenity of nature and follow the Mountain Fork River as it flows from the base of Broken Bow Lake through the park below. This area provides visitors with spectacular views, as well as excellent canoeing and fishing opportunities. Nestled in among the trees and alongside the Mountain Fork River are rustic and modern cabins, RV sites and tent campsites, as well as two group camps. 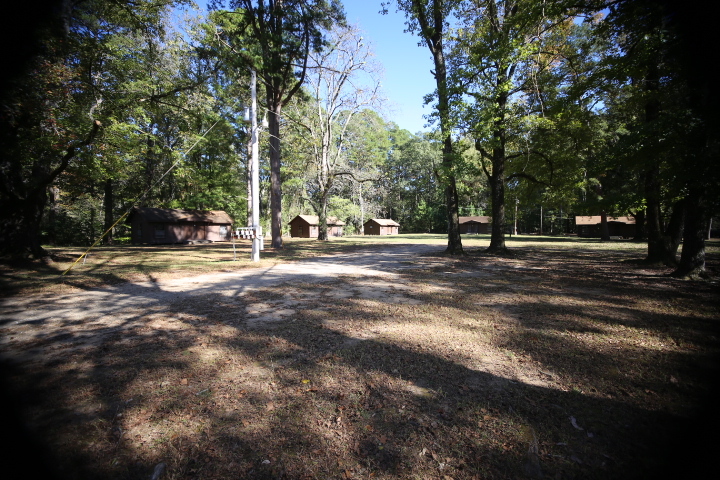 Group Camp #1 was built by the Civilian Conservation Corps in 1940 and the grounds are the original CCC Camp. 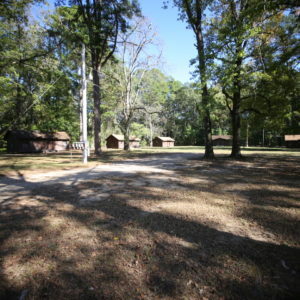 This camp offer 12 cabins, 6 on each side of the hall. Cabins have heat and air which is metered and charged by the KW hour. Each cabin has 6 bunk beds. You will need to bring your own bedding. 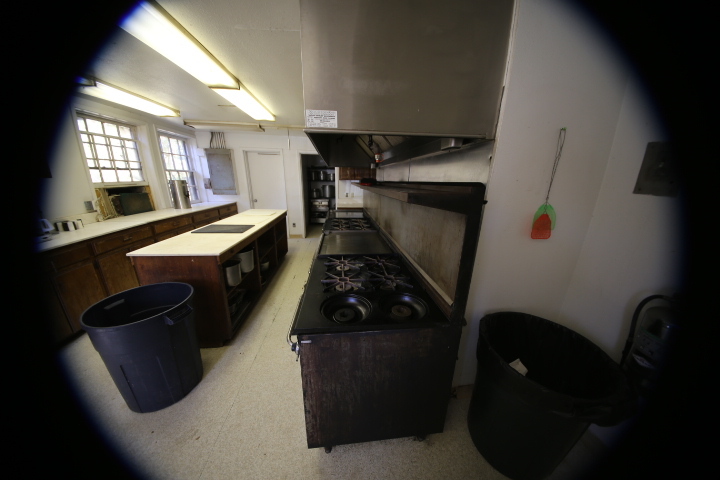 The group camp has a stocked commercial kitchen with large pots, pans and cooking utensils. 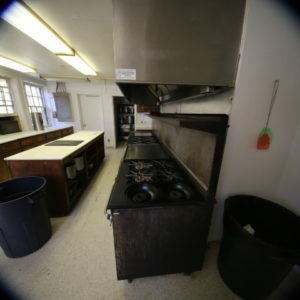 There are 4 large ovens, 2 large griddles, 12 burner tops, walk-in cooler, and 2 small chest freezers. Ice is available for purchase. 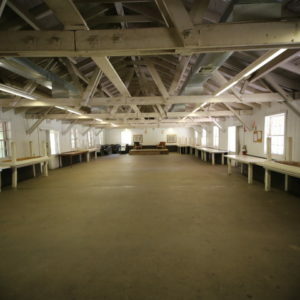 The air conditioned hall has tables and chairs for approximately 125 people. 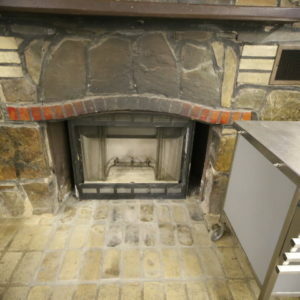 There is a fireplace in the hall (you will need to bring your own firewood). 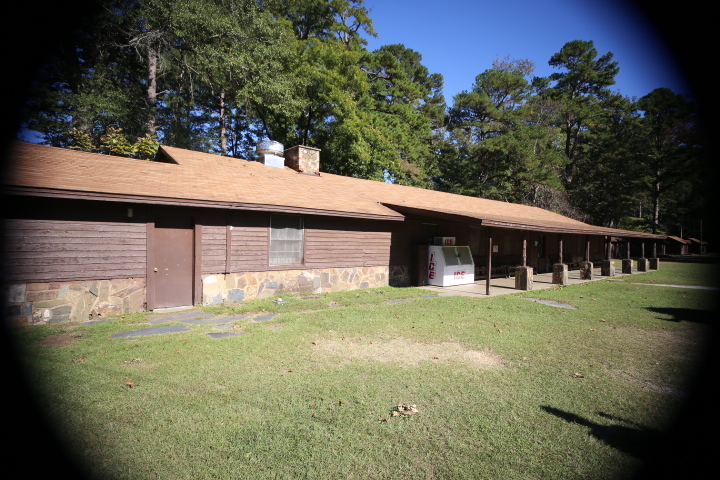 The camp has a group bath house with 5 showers, 5 toilets and 3 sinks on the men’s and women’s side of the facility. There are electrical hookups for 10 RV’s for a fee. The area between the campground and the river is available for tent camping and campfires. 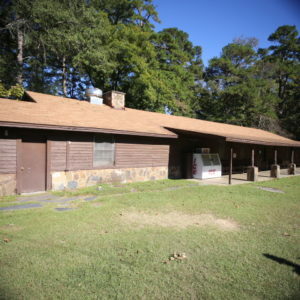 The camp has mops, brooms, buckets, trash bags and toilet tissue but you will need to bring cleaning supplies and towels. 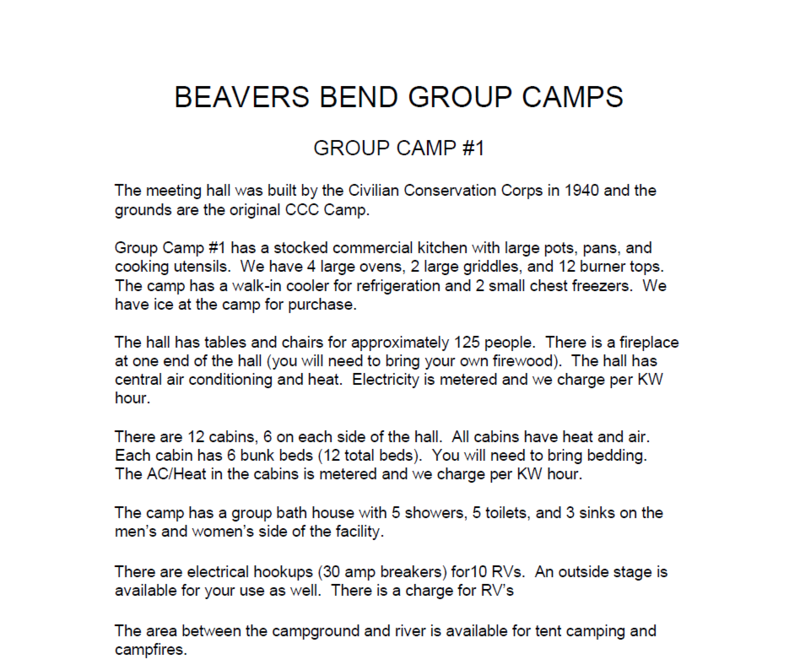 Group Camp #2 was built in the late 60’s when the Broken Bow Dam was built and the River Bend area of Beavers Bend State Park was developed. 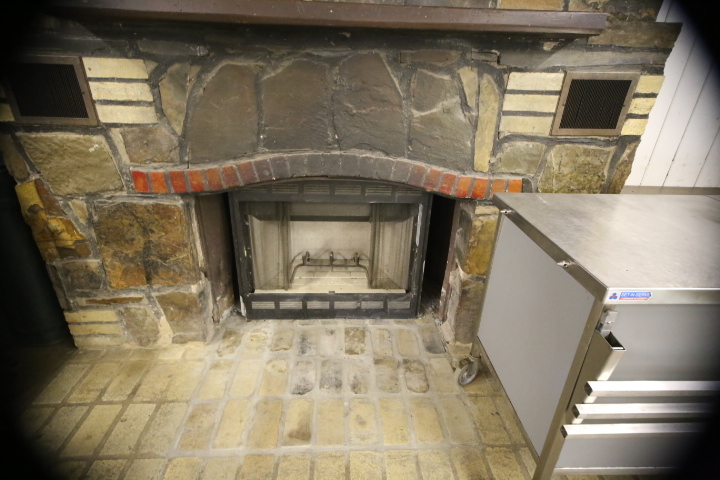 Group Camp #2 is a stocked commercial kitchen with large pots, pans, cooking utensils, 2 large ovens, a griddle, 6 burner tops, walk-in cooler, and 2 small chest freezers. There is a heated serving line for food service. Ice is available for purchase. 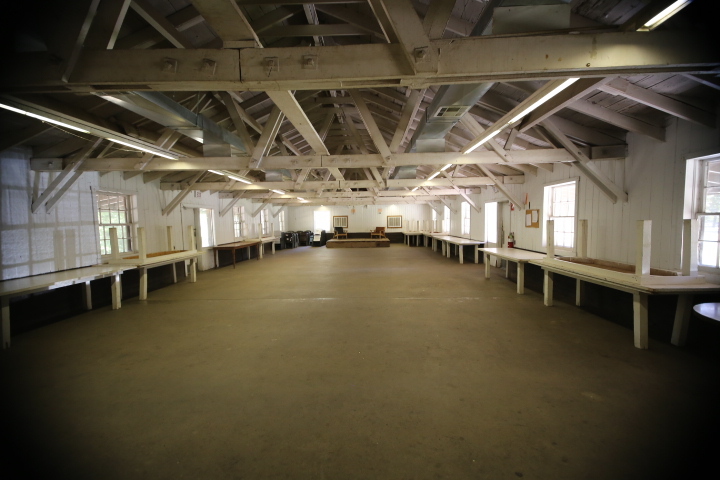 The air conditioned hall has tables and chairs for approximately 100 people. 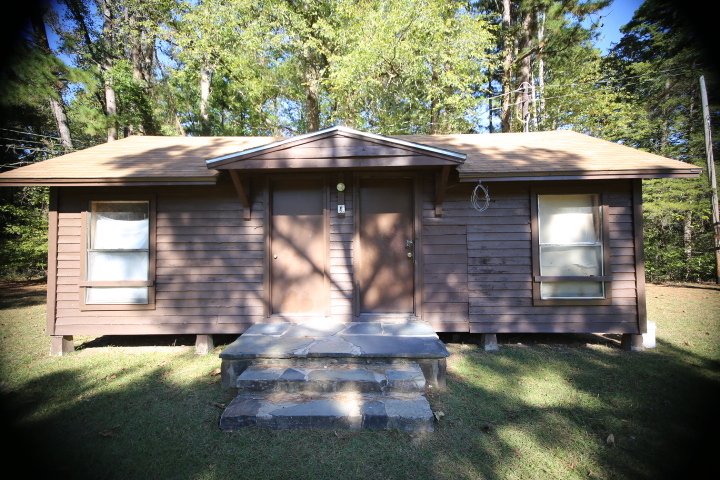 There is a bedroom with 4 twin beds and a private bathroom and shower off of the kitchen area. 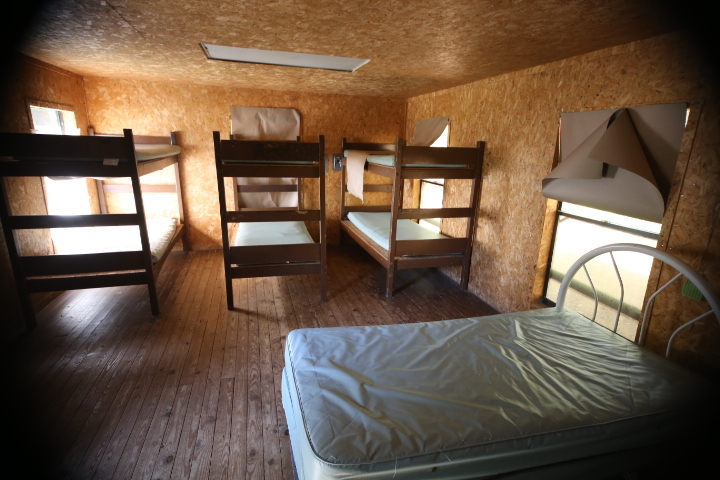 The camp has 10 cabins with heat/air window units that are metered and charged per KW hour. 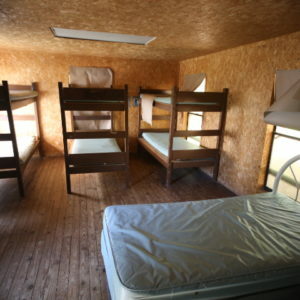 The cabins are equipped with bunk beds. Once cabin has a bathroom (toilet and sink) and sleeps 14, 10 downstairs and four in the loft. The other nine cabins sleep 16. You will need to bring your own bedding. The bath house has 5 toilets, 6 sinks and 5 showers on both the men’s and women’s side of the facility. There are 5 RV pads with electrical (30 & 50 amp breaker) and water hookups for a fee. 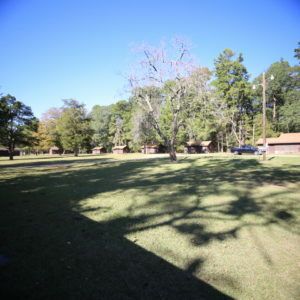 Camp Directors should be available to receive reserved area between 3:00 p.m. and 5:00 p.m., NO Exceptions unless arrangements have been made and approved by Little Dixie CAA in Hugo. 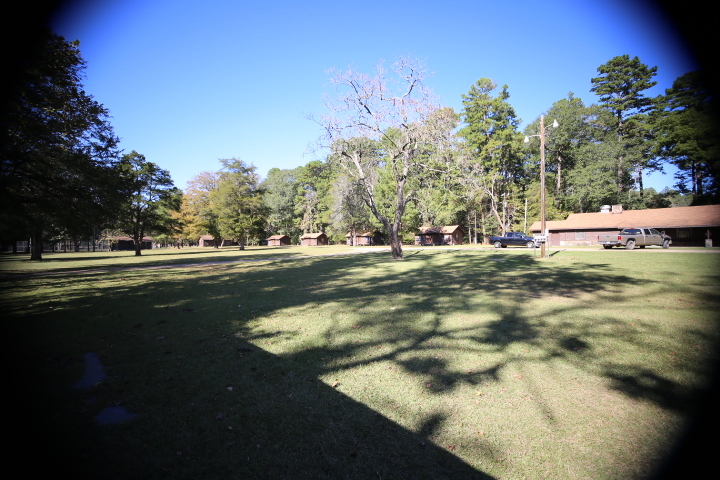 Camp Directors should make sure the buildings and grounds are clean and neat at check-out time, if not acceptable, the deposit fee will be forfeited. Youth Camps: A minimum charge of $400 per day for Group Camp #1 and a minimum charge of $400 per day for Group Camp #2 will be assessed for one to fifty occupants. A rate of $3 per day will be assessed for each additional youth in Camp #1 and Camp #2. Applicable taxes will be additional. Reunions and Adult Groups: A minimum charge of $375 per day for Group Camp #1 and a minimum charge of $400 per day for Group Camp #2 will be assess for one to fifty occupants. 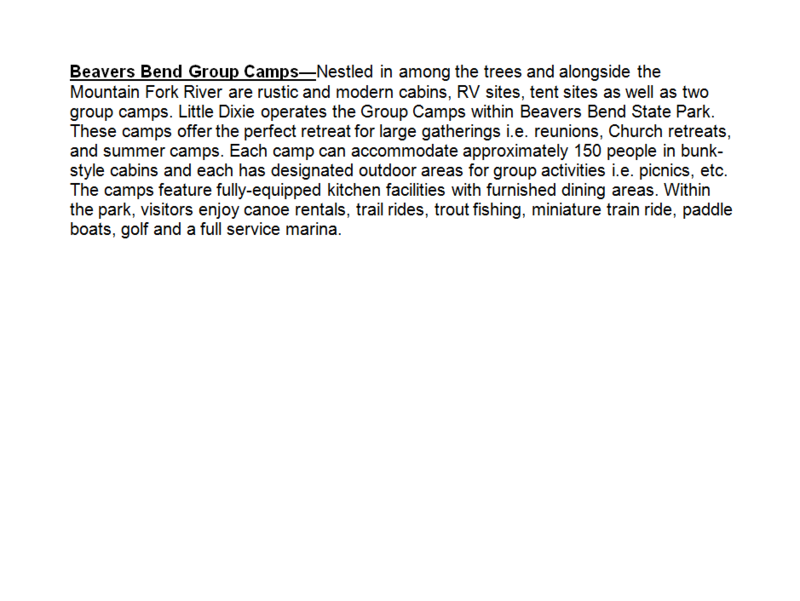 A rate of $4 per day will be assessed for each additional person with reunions and adult groups on Camp #1 and Camp #2. Babies in arms no charge. Applicable taxes will be additional. 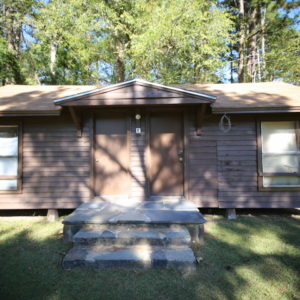 Rental of Community Building Only: $225 per day. 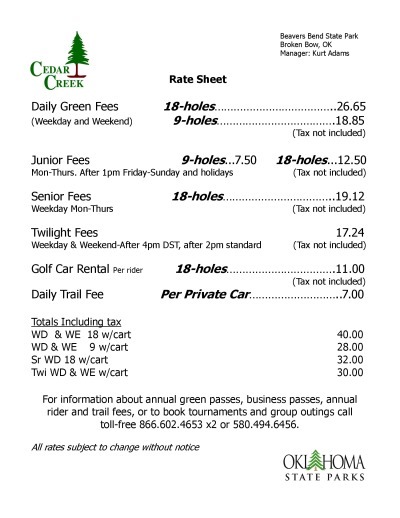 First day’s rental payable in advance. Daily charge will not be prorated. Providing for the services of a doctor in the nearest community for emergency cases. Such arrangements must be made prior to the arrival in the camp. Insuring that quiet hours will be observed at 11:00 p.m.
For scheduling, rates or more information, please contact Jim Ogden at (580) 494-6569. Group agrees to keep the building and grounds in a sanitary condition and leave them clean and sanitary upon departure. Failure to do so will result in a forfeiture of the deposit. Group agrees to abide by the rules and regulations governing the use of the State parks and organized camp. Group agrees to provide sufficient supervision to assure the safety and orderliness of the group. The premises are to be used only for authorized recreational purposes and no concessions or profit making enterprises involving the sale of goods, food or merchandise to the general public shall be conducted therein by the group. Nor will the group be permitted to operate any concession in competition with the Park for the benefit of the group. Group agrees to pay for actual electrical usage if they choose to use air conditioning or heater in cabins. Group shall not transfer or assign use permit or sublet premises or any part thereof. Upon the expiration or termination of the agreement, the remises shall be delivered in as good repair and condition as the time of check in, reasonable wear and tear and damage by the elements expected. Group agrees to pay Little Dixie Community Action Agency, Inc. for damage resulting during the use of the premises at the time of checking out. Group waives and releases all claims against Little Dixie Community Action Agency, Inc. for any damage to person or property arising from the exercise of the privileges granted by the agreement. Group agrees to conduct themselves in such a manner that no act will reflect adversely on the State of Oklahoma Tourism and Recreation Department or its holdings. Any incident to the contrary will constitute cause for terminating sty and denial of future requests for reservations.